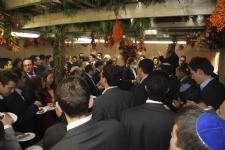 This Sukkot Chabad Lubavitch has been welcoming people to a new Sukkah in Central London. Occupying a prominent position in the heart of the city's business and legal district, the Sukkah has been talked about all over town. 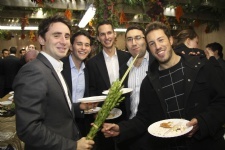 Over 600 people stopped by to eat, to shake the lulav, to daven or to just see what all the fuss was about. Large numbers gathered each day at the Sukkah including over 200 people on 2nd day Chol HaMoed for a buffet lunch sponsored by Deloitte. Mincha services attracted over 60 people each day and Chabad staff were on site throughout Chol HaMoed answering questions and explaining about Sukkot to the many people passing by. 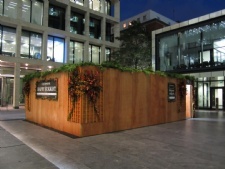 This Sukkot, Chabad Lubavitch will be welcoming people to a new public Sukkah in New Street Square, EC4. 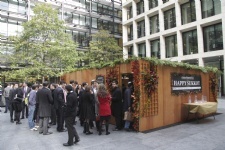 Occupying a prominent position in the heart of Central London's business and legal district, the Sukkah is located in a pedestrianised area close to Fleet Street and Chancery Lane. This is the first time a Sukkah has been constructed in public space in this part of the City. The project is a partnership between Chabad Lubavitch and a number of leading firms based in the area. It has also been supported by some generous individuals. Construction began in the week before Sukkot and has now been completed. 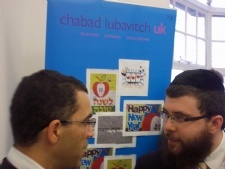 Last Tuesday lunchtime over 75 people joined Chabad of Chancery Lane for another 'Lunch in the City' event. 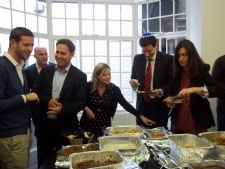 Jewish professionals from the area including bankers, lawyers, accountants and journalists came together for a pre-Rosh Nosh, to enjoy a tasty kosher lunch and to meet other Jewish people working in the area. The event was made possible thanks to kind sponsorship by a couple of individuals who work in the area who would like to remain anonymous. Many traditional Jewish students head home for Rosh Hashanah to spend this special holiday tucked away with family leaving the forgotten few wondering where to go and what to do for the High Holidays on campus.